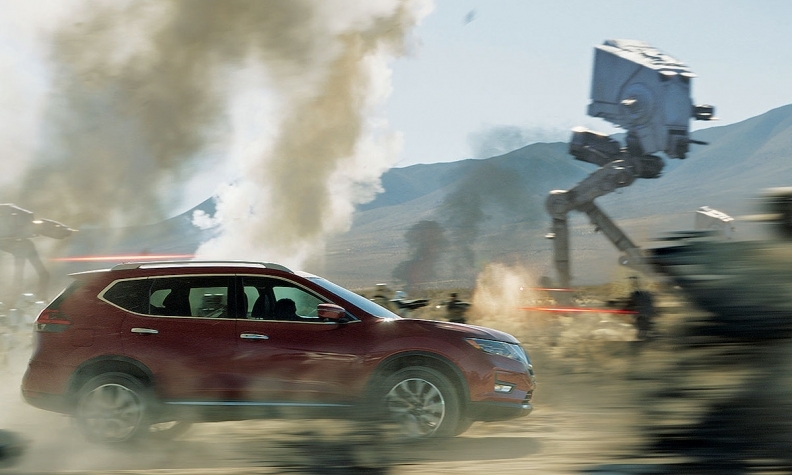 Nissan grabbed the opportunity to connect with shoppers through the latest “Star Wars” film, the coincidentally named “Rogue One.” An ad for the compact crossover is above. The Rogue was the best-selling nonpickup in December. After Nissan's Star Wars tie-in kicked Rogue sales into hyperdrive in December -- it was the top-selling utility vehicle in Canada and the U.S. market's best-selling nonpickup last month -- the automaker's marketing team is tackling a new mission: spreading the compact crossover's success to other nameplates. Nissan seized upon an opportunity to connect with shoppers through the popular franchise's latest movie -- coincidentally titled Rogue One. Jeremy Tucker, vice president of marketing communications and media at Nissan North America, said he'll incorporate lessons learned from the campaign into his next steps. He said the true goal of the campaign was name recognition. Many consumers didn't even realize Nissan made a vehicle called "Rogue," he said. The recognition -- along with strong industrywide crossover demand -- turned Rogue into Nissan's best-selling 2016 vehicle in Canada and the United States. Year-over-year Rogue sales jumped 17 per cent in Canada and 53 per cent in the United States in December, up to3,171 and 40,477 vehicles, respectively. For the year, Rogue sales rose 10.5 per cent in Canada and 15 per cent in the United States, to 40,055 and 329,904, respectively. One Nissan model should have an immediate benefit from the Star Wars marketing campaign -- the Rogue Sport, which arrives in the United States only this spring. In Canada, Nissan chose to call the same vehicle Qashqai, which it's also known as in Europe. "The Rogue Sport is coming and we want to create that recognition again, the excitement around it," Tucker told Automotive News. "It's all part of the master plan: How do you start to kind of drive that recognition and break through to consumers?" Part of the plan includes leveraging the Rogue's popularity to showcase the rest of Nissan's lineup. During the Nissan Go Rogue Year-End Event, Zimmerman Advertising, which is Nissan's Tier 2 agency, created a guide for dealerships on how to use the Rogue as the centerpiece of the showroom floor -- to "flank it" with other models and their deals. Similarly, ChooseNissan.com used the Rogue event to drive customers online and offer other vehicle options based on their online behavior. "It was a great time to get deals on the entire line," Tucker said. "Rogue was still the star and we wanted it to drive that awareness and that engagement, but we wanted to open it up across the other model lines." Ultimately, he said the Rogue One campaign, which runs until the end of April, represented a fundamental shift in how Nissan approaches marketing. The "secret sauce" of success was the involvement of the entire Nissan organization, including the 1,100 Nissan dealerships that participated. He recruited six Nissan retailers early on in the campaign to give marketing advice on behalf of the dealer body. Retailer inclusion helped bring a national branding campaign out of the ivory tower at headquarters and into local dealerships, Tucker said. He said he considers the Rogue One campaign a best practice to build around. But the question remains of how to imitate that campaign without a partner like Lucasfilm, which produces the Star Wars films. "What I've learned from this, and what I'm going to replicate, is how can we do this in every piece of big marketing we have for every big launch, to get this level of dealer engagement and involvement," Tucker said. "How do we leverage our dealers? How do we engage the organization? How do we build the brand cohesively, Tier 1 to Tier 2?" Tucker asked. "That's the future for how we'll be building marketing for Nissan."